editors | Oh, for the HOOK of a BOOK! As an adult, Thanksgiving sometimes has put me in a conundrum technically, with both British and American citizenship, as you can imagine why. I am proud of both! For me, I don’t have to be divisive, I’ve always been about the “coming together” of people. And what is thanksgiving if not the joining of others. That said, I grew up celebrating Thanksgiving here in America as a tradition and time to join with my family for food and rest together and to reflect for all I’m thankful for! I like that we can cook and eat together, play games, watch Charlie Brown’s Thanksgiving and Mayflower Voyagers, and revel in one of my favorite subjects, the Colonial Era! I remember fondly the time my son and I made “Plymouth Rock cookies” or when all three of my kids and I made turkey “thankful for” books out of paper bags. Laugh all you want, but the memories flood back, especially when my son won’t make it home from college in Washington D.C. this year for the weekend. It’s the first time since before his birth we haven’t celebrated a holiday together. Due to spending time with family, it’s one of my favorite holidays. That and I love pumpkin pie! I’m very grateful, as always, for all the support of Hook of a Book, and this year, as well, for my own writing and publishing journey. Thank you to all who’ve been a part. And above all else, I am thankful for my family, friends, love, food, laughter, and books! I’m even thankful for warmth and running water, as so many don’t have these things. What are you grateful for this year? What will you commit to in order to help others? SLUSH, a Collection of Works by Glenn Rolfe, and Edited by Me, Releases Today! It’s almost Halloween! But, for now it’s LAUNCH DAY for SLUSH, the collection of horror works by Glenn Rolfe for which I had the honor of serving as EDITOR! Glenn and I had sooooo much fun working on this together. Late nights, early mornings, evenings, weekends, and we pulled it all together in just a month!! It’s a collection that will make you cry, cringe, and maybe freak out, but it’s so worth reading. Some of the short stories have been previously published, but updated, some are short pieces such as a poem or a micro-work, but most share a similar theme. Many either take you back in time to teenage years or deal with death and grieving, but all truly make you feel something. I was so pleased that I got to write the foreword to kick off the collection, so you’ll read all my thoughts there…. Oh, also just in time for Halloween, there is a cool new story never before published towards the back with a nod to the season, it’s creepy enough for late night ghoulish reading. We hope you consider purchasing and let us know if you liked it by leaving an honest review! The cool cover is by graphic artist Jason Lynch. So psyched, check it out! 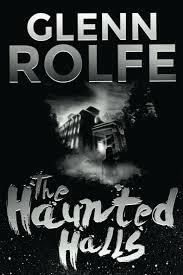 Also, get Glenn Rolfe’s The Haunted Halls, his debut novel, on sale! 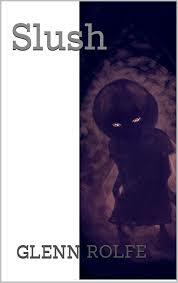 Glenn Rolfe is an author, singer, songwriter and all around fun loving guy from the haunted woods of New England. 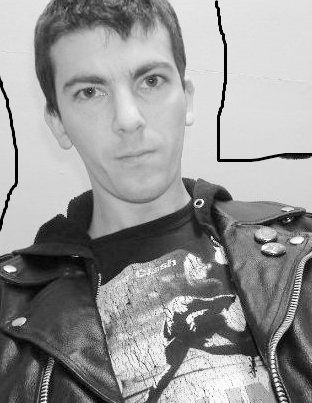 He studied Creative Writing at Southern New Hampshire University, and continues his education in the world of horror by devouring the novels of Stephen King and Richard Laymon. He and his wife, Meghan, have three children, Ruby, Ramona, and Axl. He is grateful to be loved despite his weirdness. His first collection, SLUSH, will be available for Halloween 2014. His novellas, ABRAM’S BRIDGE and BOOM TOWN, will be published by Samhain Publishing in 2015. His debut novel, THE HAUNTED HALLS, available now from James Ward Kirk Publishing.